So here we are. 2017 and it’s a brand new year. I love the feeling of a new year. Maybe it’s because I love fresh starts. Out with the old and in with the new. I get out my pen and paper and carefully write my resolutions, a tradition started by my mother when I was very young. And there it is staring back at me. Again. The vow to lose weight. I keep making this resolution year after year. Why? It may have something to do with the fact that many of us put other people first. Ahead of ourselves. Ahead of our health. While we care for others, we put everyone else’s health ahead of our own. “I don’t have time to do this now. I’ll start this tomorrow.” The excuses are never-ending. This year simply has to be different. This year I need to do this for me. 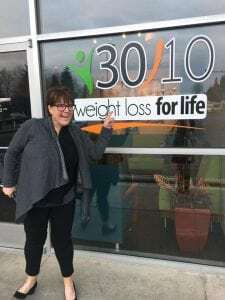 Recently, I met the owner of Redmond’s 3010 Weight Loss for Life. His name is Mark. We sat down last week and had the most meaningful and heartfelt conversation I have had with anybody about my weight in a long time. He promised to help hold me accountable and to be my cheering section. 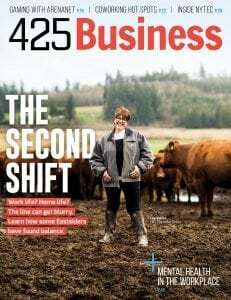 He mentioned seeing me on the cover of January’s 425 Business Magazine and said, “Can you imagine what that cover would look like this summer when you’ve taken the weight off that you want to take off?” I was able to really visualize that for the first time. His next words rang in my ears. Mark then asked me what would be different this time around, and I really had to think because I honestly wasn’t sure. I realized that what’s changed is I’m going to do this publicly. I’ve never done that. Never really shared with anyone what I’m doing because then I would have to be accountable and really stick to it. Silence has given me an “out.” If I go off the diet, no one really knows. This time, I am going to lay it all out there on this blog. On Facebook. On Instagram. On Twitter. (even if people don’t want to hear it, that’s fine!) The struggles. The wins. The good days and the bad days. Check this space if you want regular updates or to check my progress. I’ll try not to obsess too much but instead I hope to just share a bit of “the ride” and maybe we can do this together. I’ll share tips and ideas for getting healthy. I’ll share Redmond 3010’s wonderful quotes they hand out to clients each week. We even started a “Keller Group ride” at the Eastside’s newest indoor cycling studio at Redmond Town Center! As our newest client, we’re excited to help CycleBar open here in its first Northwest location. Here’s to health. Hope. Life. Accountability. Tennis shoes under our desks and a supply of veggies at work! Oh, and no excuses!